This post is sponsored by Instinct® and the BlogPaws Professional Pet Blogger Network. I am being compensated for helping spread the word about Instinct® Raw Boost® Mixers but Green and Glassie only shares information we feel is relevant to our readers. Instinct is not responsible for the content of this article. As many of you know we are a family that believes in the importance of eating healthy. Digger and Diesel are no exception. We only feed our fur babies natural grain free food. Food that is made by respected quality companies using only the best ingredients. I opened a 1 oz Trail Size bag. Check out Digger and Diesel when I dropped a few of the Instinct Raw Boost Mixers on the floor. They were right there and wanted more! They loved the Raw Boost Mixers. It is so easy to give your dog raw! Simply add Raw Boost Mixers to your dogs food. 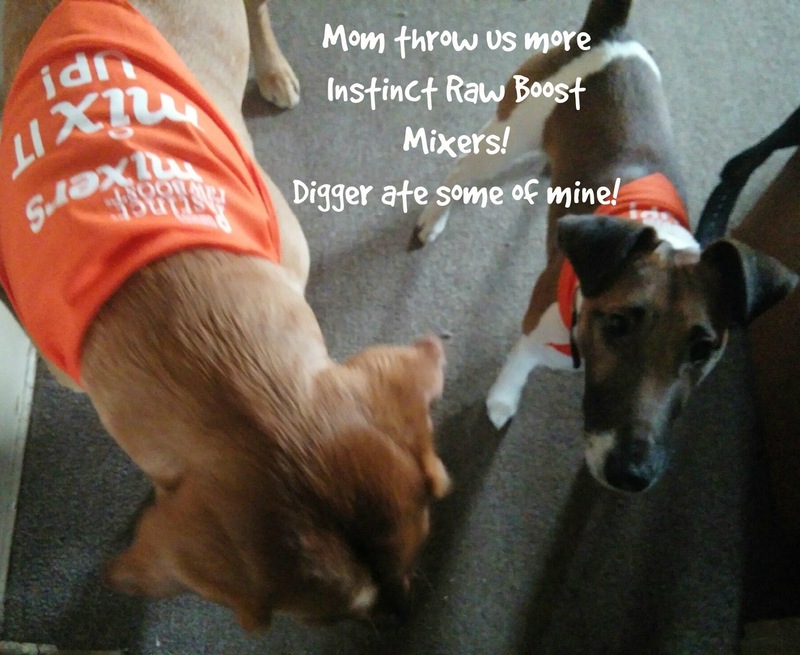 I love the fact that Instinct Raw Boost Mixers lets us give Digger and Diesel the benefit of raw food. I get a warm feeling in my heart knowing I am giving Digger and Diesel high quality food that they love! Instinct Pet Food is made in the USA using only quality natural ingredients. give your fur babies the best food. Check out your nearest PetSmart or go online at PetSmart.com and pick up some Instinct Raw Boost Mixers. The $1.99 Trail Size is a great way to try out the Raw Boost Mixer. I like the fact that they offered a trial size....tells me they want everyone to give their products a try. It is nice to have Diesel & Digger try a product to make sure they like it before I buy a larger size. I don't know which they like best - BEEF or CHICKEN! I think it is a tie - they are both delicious to Digger and Diesel. Click on this LINK to sign up for a $3.00 off coupon on Instinct products! Get your coupon and head to PetSmart! Add Instinct Raw Boost Mixers to your dogs food for a Raw Raw Boost!!! For Exclusive online coupons and promotions, helpful nutrition articles and the inside scoop of new products sign up HERE! I'll have to give this stuff a try. I think my dog would enjoy this so much. My daughter tried these for her dogs. They really seemed to like them. My dogs (all four of them) would love this. I am sure your dogs are in heaven and enjoying every last morsel. I've always thought about mixers for my dog's foods. He shows such interest every time we fill up his bowl! I don't have a dog, but my sister does! I think she would love something like for her dogs! I love feeding my golden retriever healthy food too. I haven't heard of raw mixers like these, but now I think I'll give them a try! These sound like a great way to try raw dog food. I bet my dog would love them! I have heard a lot about raw food for pets lately and it really is an area that I need to explore further. Thanks so much for the coupon! Raw food does sound like a good option. These mixers will be easy to introduce too. I will have to tell my friend about these - she is always looking for healthy options for her dog. These are perfect for treating the dogs to a special meal. 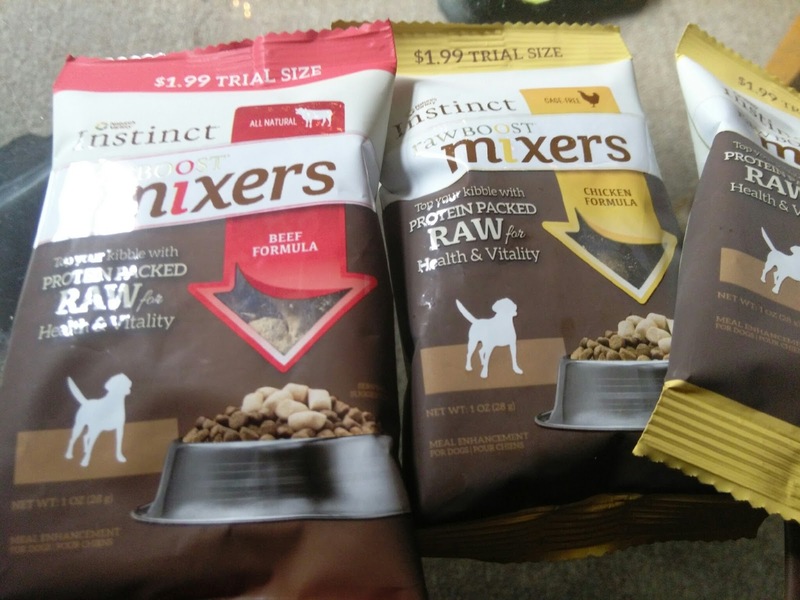 I love the trial sizes so you can figure out which mixer your dog prefers. I wish I had known more about raw food when we had our dogs. It seems like a really healthy way to feed them. I will check it out! I've been looking for a brand change for my puppies! My pooch would love these. We are ready to try something new. When I had a dog I feed him grain free. He was old and sickly when I got him. I know feeding him the best food available at the time is what gave him a few more good years. Feeding our pups healthy food is a must. I am heading to PetSmart this weekend and getting this for my dog to play at night in his board games. I love the variety. I don't own puppies, but this is great idea for puppies. I'd like to share this. Our dog is very important to us as well! These look so much healthier for dogs than rawhides, which show to not completely digest well in their system. My daughter has two dogs, Ringo and Elvis. I bet they would really go for these treats just like your pups did! I'm really curious about this brand and I love that they offer a trial size. That is so smart..it lets pet parents try it and see how their dog likes it before committing to a huge bag. Wow this food sounds like it provides amazing nutrients for your pets. We don't have any pets. But i'll have to recommend this to friends. I am planning on getting a dog later this year and will have to keep these mixers in mind. Doing research ahead of time and will try this for sure! I'll have to try these with my dogs. I'm sure they'll love them. I agree give your fur babies the best food. I have a kitty and shop at Petsmart all the time! I dont have any fur babies. But looking from your reivews seems like this would be great for anyone who loves their fur babies.